Do you have a room in your house where the wifi never seems to work? We did, so I did a bit of research and found a quick and easy way to extend the wireless signal in our house. There are several reasons you may have a dead zone in your house. If you have your wireless router in one corner of the house an opposite corner of the house may have weak signal. Metal, whether in the construction of the house or household appliances, can block wifi signals. Also, other technology such as microwave ovens, cordless telephones, baby monitors and more can interfere with a wireless internet signal. Ping: You’ll probably notice a slow responding internet if you see 500-1000ms or higher. Download Speed: Download speed is how quickly you can download items FROM the internet TO your device. If you’re trying to stream music or videos you’ll want this to be 10Mbps or more. Upload Speed: Upload speed is how quickly you can upload items TO the internet FROM your device. This number will usually be substantially lower but you shouldn’t notice any negative effects unless you are trying to send large files to the internet. Rather than looking at the absolute values of each of these measurements you can use SpeedTest to compare your service from one room to the next. Run the test in a few different areas of your house to confirm if you have a problem area. It may also help to run the test at different times of the day as you should notice different speeds. So now you know you have a deadspot in your house. What are your options? Some options include changing the location of your wireless router or relocating electronics that may be interfering with your wifi signal. If your router is low or in a cabinet you could also mount it outside the cabinet and higher. I didn’t want to display the ugly router in the center of my house so I kept searching for some other options and came across an inexpensive one that worked well for me. (Please note that this post includes affiliate links for a product which I use and am happy to recommend.) I got a NetGear WiFi Range Extender (sometimes also called a wifi booster or wifi repeater) which was able to boost my wireless signal so it now reached the opposite corner of the house! 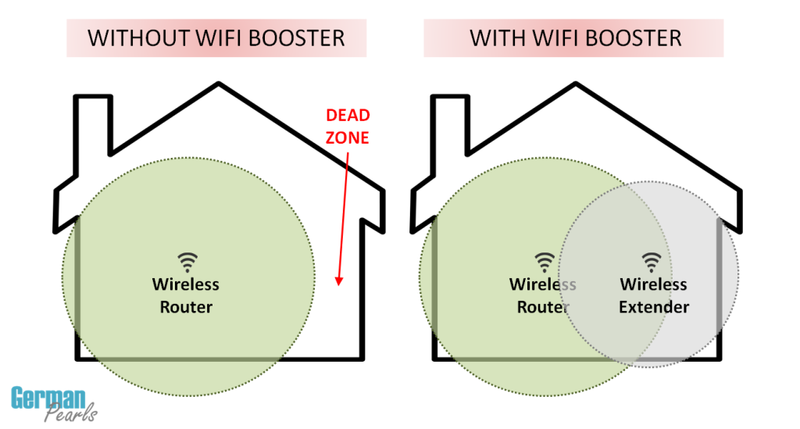 Think of a wifi booster as a wifi range extender. It picks up the signal from your wireless router and then projects it back out. So, if you place it at the outer limit of your existing wifi signal you can boost that signal further. In the example below the wireless router extends outward in the green colored circle. However, it doesn’t reach the right side of the house. If you place the wifi booster toward the outer limit of the wireless router it will then retransmit the signal and create its own new range (displayed as the gray circle). Plug the Netgear WiFi Range Extender into the power outlet. That’s it! No extra cabling required! I had some questions before I purchased the item but have been happy since it’s been installed. If you have questions on the device feel free to contact us or leave a comment below. Good luck! My son’s room is at the opposite end of the house from our router, and he has complained about the strength of it for a while. 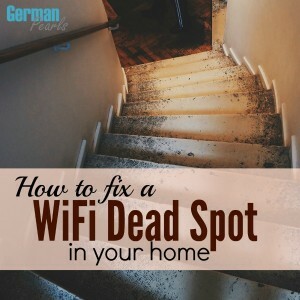 I am showing him this post – and maybe we can fix the issue without the purchase of a new router! Thank you Amy! That’s exactly why I ended up getting this. I have a scrapbook/craft room at the opposite end of the house (and a washer/dryer were in the path). My little guys hang out with me when I’m scrapbooking and didn’t understand why they couldn’t use their devices. 🙂 I installed this in an outlet outside the door to the room and it’s much better now. 🙂 Good luck. Can it be plugged into an extension cord or must it be plugged directly to outlet? Assuming it’s a safe use of an extension cord I think putting it in an extension cord would be fine. If you get decent wifi signal near the door to the patio you could place the wifi booster near the door (inside). It could then potentially help boost the signal so when you’re outside you’d get it. There are so many things that can interfere with signals it’s hard to know for sure without knowing more about your particular setup. When my mom installed a wi-fi to our house weeks ago, I just realized that my room is a wi-fi dead spot. Well, my mom doesn’t know how to fix it that is why I should be the one who’s finding a way. Glad to found this article. It helped a lot! Hoping it will work really fine. Glad to hear this helped! Good luck with fixing your deadspot! Can I put more than one in the house? We have a large 3 level house, my parents live downstairs, my sons upstairs , the main router is on main floor at opposite end of house. Yes, absolutely. Ideally you would have the main router centrally located in the house but that’s not always possible (or practical). In your situation you could put one of these on the top floor and one on the lower level. Good luck! Our homeschool group meets in a local church. Our “teacher’s lounge” is in somewhat of a dead zone. We tried one of our member’s wi-fi booster and it wouldn’t “work” because the netowork is password protected. The member said that she couldn’t get it to work in her own home until she took the password off. We have access to the password to connect to the network, but can’t remove the password. Would that be an issue with this particular wi-fi booster? I purchased the Netgear wifi booster through your link. I set it up at co-op per the instructions and it worked perfectly! We are leaving it plugged in for the church to use as well. They were happy to hear that extended the signal to the basement too! Thank you so much for your help! Will it be secure for my network if i am connecting my ROUTER to RANGE EXTENDER ? I mean I am afraid if someone would hack into my NETWORK . You can set up security features and password for the extender just as you would a router. I have a password on both the router and the range extender to keep them both secure. Hi I’ve read your article and that you use netgear. The problem I’m having is that Best Buy said it has to be compatible with my laptop. So they told me what was compatible with my computer, but what if we have a visitor, does that mean their computer won’t be compatible? Also I researched the different boosters/extenders including netgear and there were so many complaints such as it worked and then stopped working or it didn’t work at all. Can you help me with all this confusing information out there. I followed Amy’s advice and set the netgear in a church basement. Everyone in our homeschool co-op can sign on using everything from different phones to ipads and laptops! It was exactly what we needed and we haven’t had any issues! I am very grateful to have found Amy’s post and appreciate the follow up too! Can I get a little cheaper wifi range extender? NetGear WiFi Range Extender is a bit expensive for me.Please suggest me some Wifi Range Extenders. If the Netgear one is too much you could look at the TP-link one here: http://amzn.to/1LBnhxZ . It’s a little less expensive than the Netgear one but doesn’t get as good of reviews. Such an informative post buddy. I am always in search of such stuff that can help me to increase my wi-fi speed. Great – glad it helped! Will the Netgear N300 work with FIOS router (Actiontec M1424WR); Its MoCA you know. It would make sense to me that it would work but checking around online I found mixed results. Some people seemed to get it to work and others had difficulty. Good luck – let us know how you make out!